Most people know that an apprenticeship lets you train for a job by actually doing it. But what is an apprenticeship all about? Why not get the best of both worlds with a degree apprenticeship? Get paid to train in a high-skilled job and while earning a degree at uni – with the fees paid for you! An apprenticeship lets you get on-the-job training and study for qualifications at the same time. When you do an apprenticeship, you are an employee of the company that trains you, which means you will get paid at least £3.50 an hour, and often a lot more. 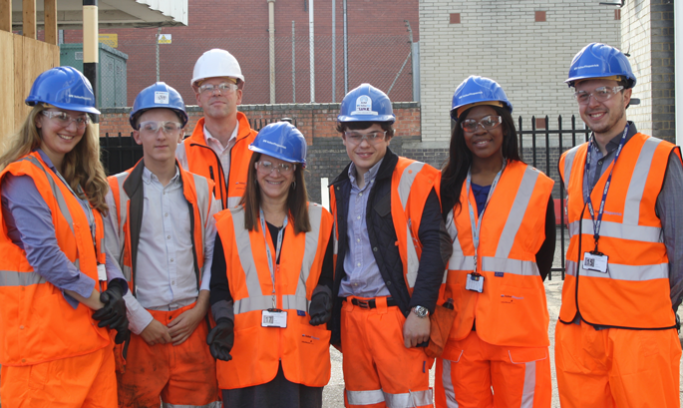 Employers are big fans of apprentices because they finish up their training with bags of real life work experience. Because it is their aim to hire you as a permanent employee, employers work hard to design apprenticeships to give you all the skills you need to do your job. According to the government, there is now a record number of apprenticeships. In fact, 491,300 people started an apprenticeship in the 2016-2017 academic year. On average there are 23,000 apprenticeship opportunities listed on the government's find an apprenticeship tool every month. 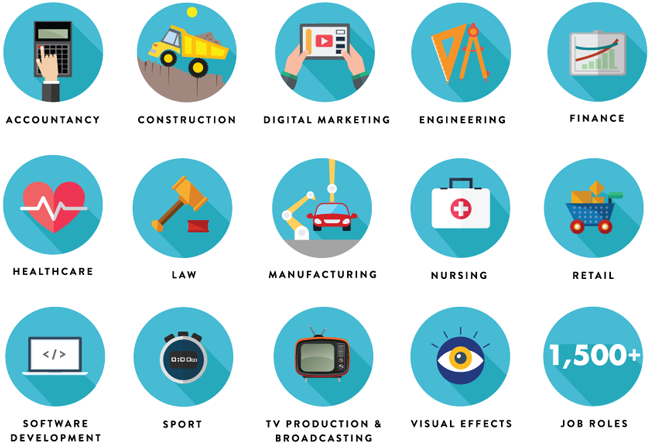 What's more, there are now 520 different kinds of apprenticeship out there! This means it's never been a better time to be an apprentice, since jobs are being created all the time and you can now train for highly skilled jobs by taking a higher or degree apprenticeship. Scroll down for more information on this. So there's a good chance you can find an apprenticeship that fits your future plans, whether you're looking for a career as an engineer, a bank manager, a zookeeper or even an airline pilot. How old do you have to be to do apprenticeship? You can become an apprentice from the age of 16 and up to any age. This is because an apprenticeship is a full-time job so you need to have finished school to start one. If you want to do a higher or degree apprenticeship instead of university, the chances are you'll do A-levels or a lower-level apprenticeship before starting aged 18. Intermediate: Like studying for up to 5 GCSEs. Advanced: Like studying for 2 A levels. Higher: Like taking a level 4 NVQ, Higher National Diploma or Foundation Degree. Degree: Like taking a Bachelor's or Master's degree. You get the chance to see whether you like a job before committing to it for a lifetime. You avoid thousands of pounds of student debt. You can go into highly skilled jobs beyond those that university prepares you for. As you get more and more capable, it can even boost your confidence! You can do a degree with your employer later on – or even as part of your apprenticeship if you do a higher or degree apprenticeship. Want to know more? Find out why you should consider an apprenticeship. How does an apprenticeship compare with university? Apprenticeships aren't for everyone, and university might be the right choice for you if you want to be a doctor or lawyer, or simply love your subject. If you're still confused about whether university or an apprenticeship is for you, check out this article. This depends on the level of apprenticeship you'd like to do. The exact requirements are very much dependent on the course you want to apply for, so while this guidance will help, make sure you find out all about your apprenticeship before applying. If you're kicking off with an intermediate apprenticeship, you might not need any formal qualifications. You need to have "functional skills qualifications" in at least English and Maths. These are a bit like GCSEs, and if you don't already have them you can get them as part of your apprenticeship training. If you already have a C or above in GCSE Maths and English you won’t need to do this. If you're applying for an advanced apprenticeship, you will normally need to have completed an intermediate one, or have around 5 GCSEs at A*-C.
If you're after a higher or degree apprenticeship, you’ll either need to have done an advanced one already, or have a couple of A-levels passes or a level 3 NVQ. If you're doing your A-levels and want to do a higher or degree apprenticeship, don't worry! You don't need an intermediate or advanced apprenticeship. A higher or degree apprenticeship is a great next step after your A-levels, and as long as you pass two courses with a C or above, you probably have what you need. How long will it take to train as an apprentice? It can take anywhere from one to four years to complete an apprenticeship. How long it takes depends on the level you are training at and what skills and qualifications you have already. Will I get paid as an apprentice? Yes! The great thing about apprenticeships is that you have an employer – and they have to pay you by law. Employers must pay apprentices at least £3.70 per hour - that rate applies if you're under 19 or if you're over 19 and in your first year of the programme (2018). If you're an apprentice aged 19 or over, and you've completed your first year, then you'll be paid at least the minimum wage rate for your age, which from April 2018 will be £5.90. The best-paying degree apprenticeships start at £25,000. Whatever you start on, your wages will usually go up as you train. Your employer must also give you at least 20 days paid holiday a year. As an apprentice you’ll do most of your learning on the job at work. You'll usually work around 30 hours a week and do around one day of training per week, often at a local college. Most of your assessment is done in the workplace but you might have to take some exams too. What qualifications will I get as an apprentice? Functional skills: GCSE level qualifications in Maths, English and IT. 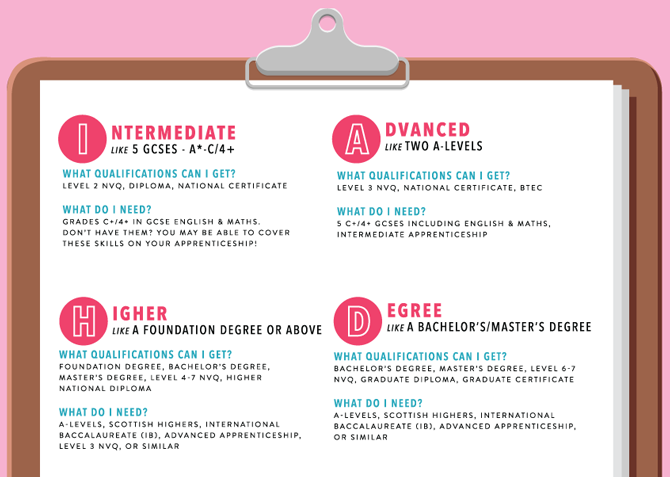 National vocational qualifications (NVQs): From level 2 (similar to getting around 5 GCSEs) right up to level 5 (similar to a postgraduate degree). Technical certificates: Like a BTEC or City & Guilds Progression Award. Academic qualifications: Like a Higher National Certificate (HNC), Higher National Diploma (HND), a Foundation degree, or a Bachelor's or Master's degree if you do a Degree Apprenticeship. Lots of employers offer the chance to apply for apprenticeships directly on their websites, so it’s important to do your homework and job search online. You can check out the jobs and courses section on our site to find an apprenticeship you can apply for now. You can also search on dedicated websites like The National Apprenticeships Service or, if you’re in Scotland, Skills Development Scotland. If you have a careers adviser in school, talk to them about apprenticeships early on as they will be able to tell you what's available in your local area. Can I apply for an apprenticeship on the Success at School site? There are loads of training programmes and apprenticeships on offer with employers on our site. Check out our apprenticeships listing to see what you can apply for today. I have lots of other questions! Where should I start? We think we've answered the question "what is an apprenticeship?" pretty thoroughly. But we've got loads of resources to help you plan, find an apprenticeship and make a stellar application. We've grouped them by topic to be super helpful!